Once you visit 3V Gear, you notice the prices immediately. Tactical nylon and packs can range from too cheap (think Amazon.com no-name imports) to ridiculously expensive (think Maxpedition) to “holy crap oh God no” stratospheric (think Kifaru). Readers know I like to review things that are in the middle range of affordability. I think it is incredibly important to stay grounded with your equipment when writing on such a potentially expensive topic as guns and tactical gear. I have 4 Kids. I know how much it hurts to spend $400 on TamiFlu for the whole family. I FEEL YOU MY MIDDLE CLASS FELLOW AMERICANS. I may review some High End stuff occasionally, but much of that stuff is out of reach for the modern rifleman and especially shooters just getting their feet wet. The prices of 3V Gear come in at a comfortable level. The Outlaw II retails in at 43.95 and has design cues from Maxpedition style slingers. As a proud owner of Maxpedition products, I can attest to the quality, but even my little Remora is a bit eye watering for the price of $102 and it holds *far less* gear than the Outlaw II. So is 3V gear giving us a reliable workhorse for the price, or would we be better to scrounge every penny for higher end nylon? Let’s check it out. The Outlaw II is a gearslinger meaning it has one strap to secure it around your shoulder and back. A secondary strap secures it to prevent rotation and clips around the front of the users chest. The main compartment is large enough for rolled up clothes, hats, misc support gear, a 15 inch laptop, and features a zippered mesh pouch with another internal pouch. Total specs will be below the article. It has four exterior pockets, the largest of which contains a divider with an organisational panel, a flat “hidden” pocket with velcro lining for a CCW piece or hydration bladder, a smaller “sunnies” type pocket is at the head of the pack and with it additional internal pocket and organizers, and finally the third and smallest pocket is a flat document pocket on the packs exterior. There is a water bottle pouch on the packs R side. Main Compartment with some gear. The mesh pocket offers another secure storage area and the padded (on bottom) sleeve holds a laptop. Small glasses / tool pocket. I use this area with the elastic organizer to hold tools I may need on the rifle range. The pack has a spacious front organization pocket with room to hold all your first aid gear or other small items. The front flat pocket is perfect for my plastic carrier which houses my rifle data books. Stitching is done well, with double stitching on all load bearing points such as the shoulder strap and molle webbing. The buckles feel as though they are a good quality plastic. Breathable mesh and a patterned foam backer keep the pack and straps breathable and elevated off the skin. Overall a comfortable setup. The foam backer raises the pack off your shirt / skin for airflow. The sling type packs are perfect for Rifleman since 90% of the time, your rifle will remain strong side. Without a strap or thick foam to impede you, your shooting remains un-affected and positions such as prone are just as comfortable with the backpack as without. The pack is holding up well, and has been with me to several range trips since it was sent over in November of 2017. Use for the bag has been to haul stuff to and from the range. I use it as a extended range bag so I can grab a rifle, grab the bag, and all my essential range gear goes for the ride with me. I have a minor complaint: I have pulled some of the thin cord pulls out, and that’s because the small cord they use is not mil-spec paracord. I will be replacing the pulls with Mil-Spec para-cord. The thicker para-cord will not fit through the small seam at the bottom of the eyelet. That’s my main gripe, but overall the bag is a excellent grab for the dollar. I was approached by 3V Gear to see if there was an interest in an advertising relationship. I will only enter into such a relationship if the product is something I would recommend to my readers. As you know, I cannot advertise something I do not support. 3V Gear is something I am comfortable recommending to my readers as I feel they are well balanced between cost and quality. I think it’s a great purchase for hauling gear to and from the range, as well as any other daily tasks you might want to assign to it. While not as high-end as MaxPedition, it offers more value to the dollar. My recommendations would be for mil-spec para cord pulls to be included, but that is something any of us can do at home. Other than that, this bag will accompany me to competitions and will be my range and competition bag from here on out. Grab yours here. Thanks for this review! 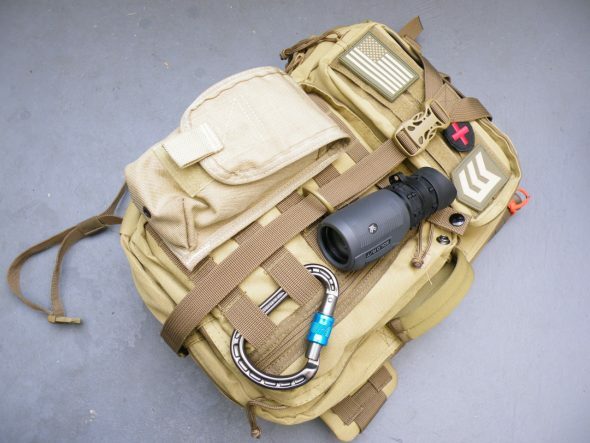 I’m not really into this bag, per se, but I hopped on over to 3V Gear’s website and am currently browsing all their stock, making mental notes of things I need to buy. I use GORUCK bags exclusively .. well almost exclusively .. i have a bunch of kifaru packs / systems. Is it possible to fit a 15″ x 10″ x 1″ laptop into the laptop sleeve and still get the bag zipped up? where did you find the plastic carrier of the mil dot master book. That is a Velostat 4025 Electrically Conductive Hinged Container. It is 5.25 x 7.25 inches. Available from a few retailers online.